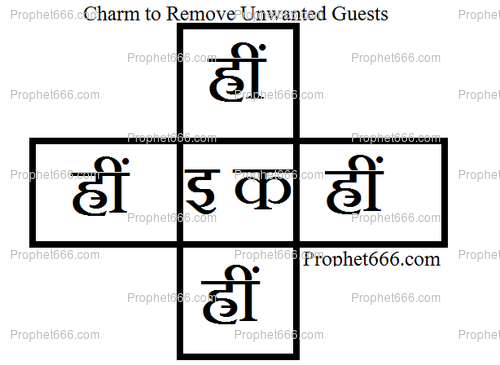 In this post, I have described a specific Indian Occult Charm, which works like a Uchchatan Yantra to remove an unwanted person, enemy or guest from the house or a jointly shared premises. This Indian Voodoo Charm, which is very simple to prepare and use and is a stand alone Voodoo Experiment to remove an unwelcome person, including and enemy from your life. Once the Uchchatan Yantra has been prepared, it should be folded and placed under the mattress or sleeping place of the person who is sought to be removed from your life, in the approximate position where he or she places the head while sleeping at night. The Yantra can also be used to remove an unwanted husband, wife or lover from your life. However, a word of caution the Uchchatan Yantra should never be used to harass an Innocent person or a person who has committed a mistake and is likely to repent and make up for it. 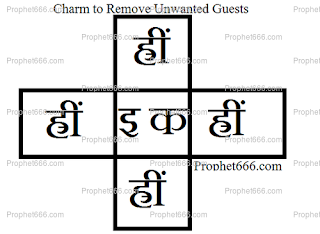 The Yantra should be used only if the unwanted person is harassing you and making your life miserable and the situation has gone beyond your control and you are helpless and left with no other option. Then you could try any other remedy to remove that person, this remedy is specific to what has been mentioned in the article. Sir how can this be used for an enemy in professional sphere, who hinders the progress and routine work. Yes, you can use it on such a person, but the charm has to be kept under his sleeping place. You can post your queries here, on the specific posts. How long do we have to keep this yantra under their mattress?? Just keep it there and forget about it for some days, you can remove it and immerse it in flowing water after the guests and moved out. Hello Sir, can I instead stick it to the bottom of the bed just below they kep tgheir head.? And also, is there any dimension or size to be followed while drawing the yantra ? It can be stuck to the bottom, below where they place their heads. There is no exact dimension to be follower, use the image a guideline. Sir the person is not harrasing. But I don't like the person to stay at my home. As I loose my privacy.what to do in this case? ?